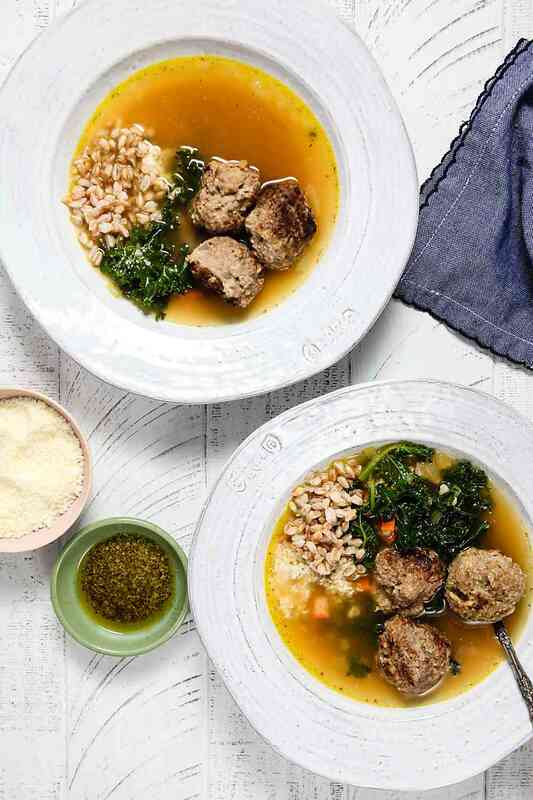 Italian Meatball and Farro Soup with Pesto | Healthy. Delicious. 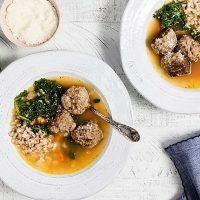 Italian meatball and farro soup is a warm and hearty dinner that’s perfect for chilly fall nights. This fall has been exceptionally warm but November – and the cold weather that comes along with it – is finally here. You know what that means: the return of soup season! This Italian meatball and farro soup is great for this transitional weather. It’s warm and comforting without being too heavy. 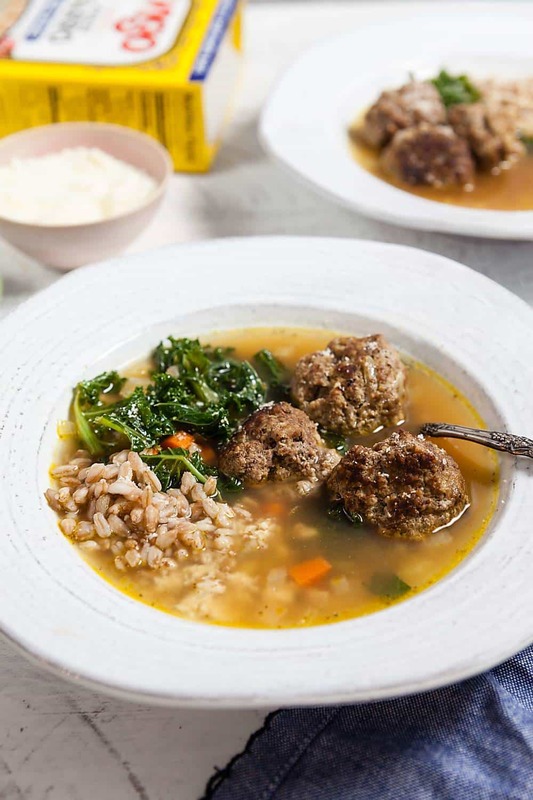 This soup features flavorful homemade meatballs and nutty farro in a light chicken broth. Chopped kale and a little bit of pesto swirled in adds a burst of fresh flavor that will keep you coming back for more. 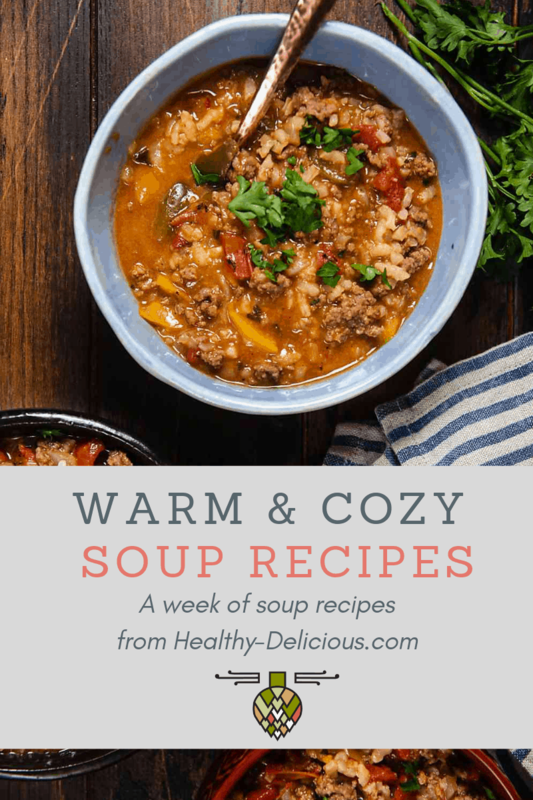 For this soup, I used two items from Vigo, an Italian import company based out of Tampa, that has some really great products. They were founded in 1947 and are still a family-owned business today! 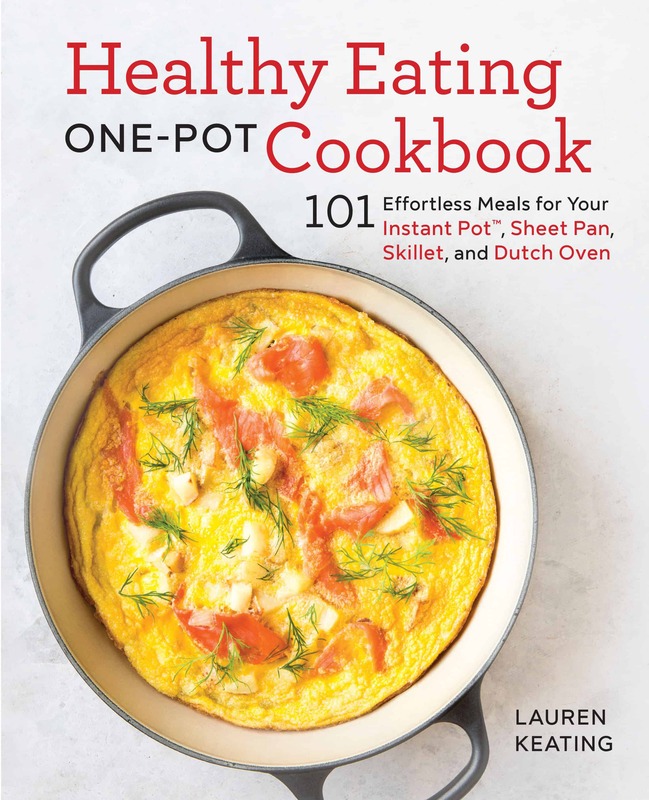 The first, and one of the key ingredients in this soup, is their Farro Boil-In-Bag. If you’ve been reading Healthy Delicious for a while, you know that farro is one of my favorite grains. Its barley-like texture and nutty flavor is great in soups and stews, but I also love using it to add texture to potato rosti or as a hearty alternative to risotto. Farro is high in protein and fiber, so it’s a really great choice. This boil in the bag version is brilliant! It’s pearled, which means part of the hull has been removed, resulting in a quicker cook time. The boil in the bag style also means you don’t need to measure out your water and doesn’t create a mess in the bottom of your pan. I prepare the rest of this soup while the farro cooks. 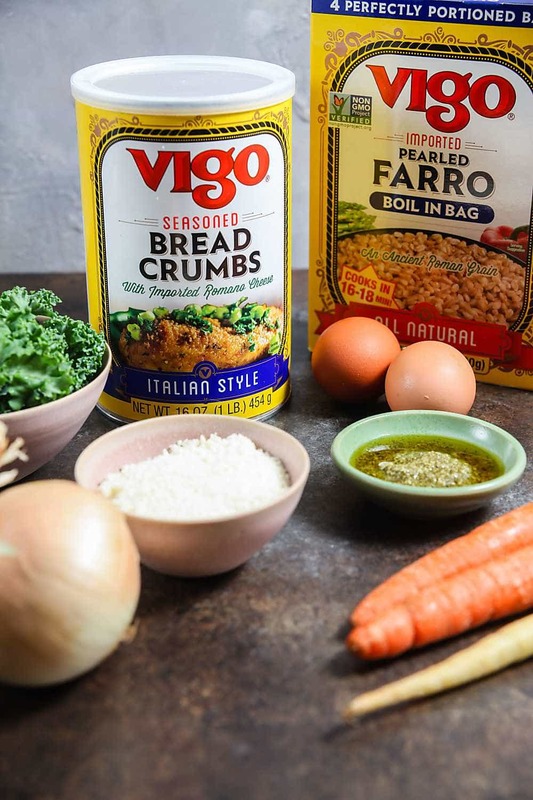 The other fun product that I used is Vigo’s Italian Style Seasoned Bread Crumbs. They’re the only breadcrumbs made with imported Pecorino Romano cheese and they use a blend of 11 spices that’s mixed at their Tampa facility. They have a ton of flavor, which means you can keep the rest of the ingredients in the meatballs super simple. I just add some onion and eggs to hold everything together. Brown the meatballs in some oil so they get a nice, crispy crust, then simmer them in the soup until they’re cooked the rest of the way through. 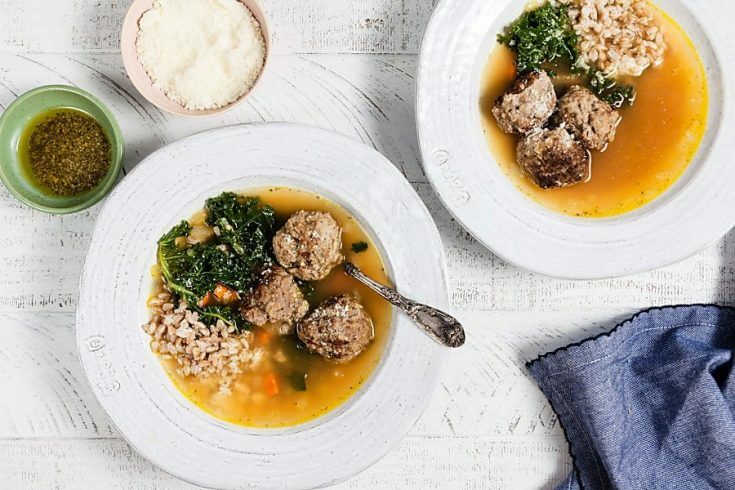 You can also make the meatballs ahead of time (cook them fully) and store them in the freezer for super quick and easy soup any night of the week. 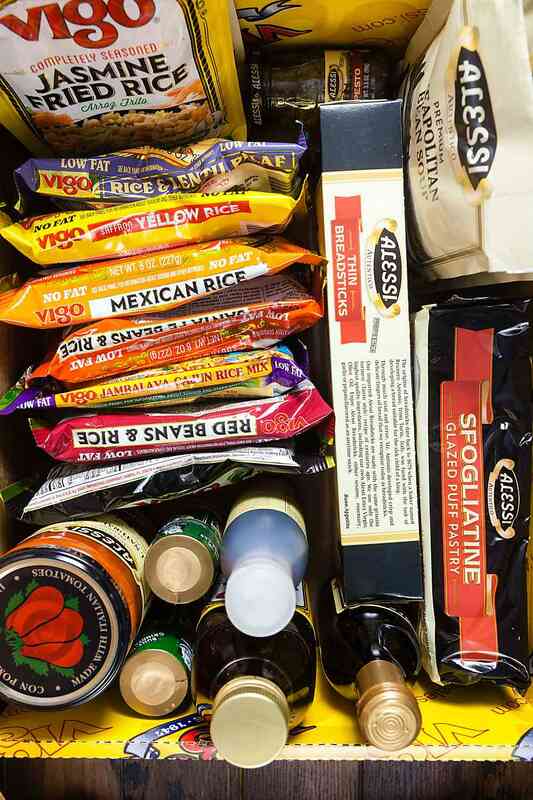 Vigo products are available at your local supermarket, or you can also shop Vigo’s online store! Be sure to enter via the widget below for a chance to win a selection of products like the ones shown here. Prepare the farro according to the package directions. Meanwhile, in a large mixing bowl combine the ground beef, eggs, breadcrumbs, and 1/2 of the onion. Use your hands to mix everything together, taking care not to overwork the meat. Divide the mixture into 18 rounds. Heat the olive oil in a large soup pot set over high heat. Add the meatballs, working in batches if necessary, and cook for 3 minutes on each side or until thoroughly browned. Use a slotted spoon the transfer the meatballs to a plate. Add the remaining onion to the pot and reduce the heat to medium. Cook 3-4 minutes, or until the onion begins to soften. Add the carrot and celery and cook 5 minutes. Add the chicken stock and 2 cups of water. Bring the soup to a simmer. Add the meatballs back to the pot and cook 10 minutes, or until cooked through. Stir in the farro, kale, and pesto; cook 2-3 minutes or until the kale wilts. I don’t think I’ve ever heard of this brand before! I love to make their Paella and add in a bunch of chicken, veggies and sausage. It gets soooo flavorful. I’ve never used Vigo products, but I like a lot of what I saw on their website. I’d start with their jarred artichokes to cook with chicken.